John Morada (left) and students visit the Google campus in Mountain View, California. 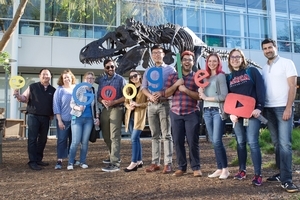 In March, a group of six AU computer science students boarded a plane for the spring break of a lifetime-a week on the West Coast, tours of technology giants Google and Oracle, and meetings with some of Silicon Valley's biggest tech luminaries. In short, a behind-the-scenes look at how innovation happens in the Valley. The driving force behind this "tech safari" was AU alumnus John Morada (BS computer science '00), a member of the American University Alumni Board and former co-chair of the San Francisco chapter of the AU Alumni Association. When Morada joined the alumni board in 2016, his number one goal was to have a direct and lasting impact on AU students during their college years and beyond. To accomplish this, Morada developed a plan to send students on a trip to Silicon Valley and give them a live, immersive perspective on the Valley's innovation culture. "Thanks to John's vision, hard work, and generosity, our students had an incredible, once-in-a-lifetime experience," says Peter Starr, dean of the College of Arts and Sciences. "The trip opened up all kinds of possibilities for them, showing them how to navigate a vital and complex industry. I believe this trip will shape their futures." Morada believes it's critical for East Coast computer science students to be exposed to West Coast thinking. "Innovation is not the same on the East and West coasts. "Differences from government to private, or from aerospace to healthcare, can be daunting to define," he says. "I wanted to give AU computer science students an opportunity to hear and learn how innovation thinking happens here in Silicon Valley. Morada is speaking from experience. He started his career in Washington as a developer for the National Institutes of Health, and he now works as a VP of business development at a startup. There, he focuses on business development with open source companies, folding them into an ecosystem. His career has spanned both startups and leading global consulting companies, and he currently serves on the advisory boards for the Silicon Valley Education Foundation and the Aurum Preparatory Charter School in Oakland, Calif. He also advises two startup companies pro bono while spinning up his own robotics company. "Coming out to Silicon Valley and being here for the past five years has really opened my eyes beyond what I grew up understanding about traditional business," he says. "The pace is incredibly different, and the thought process is certainly different. The beauty and heart of Silicon Valley culture is how it teaches you to absorb failing, learn from it, and get back on your feet with an even better way of doing something. I embrace non-linear thinking because I've found that really wins the day here." To apply for the tech safari, students wrote essays about technology trends and interviewed with faculty in the AU Department of Computer Science. The winning cohort of juniors and seniors included Makaila Akahoshi, Sarah Hendricks, Gyeongbae Jung, Erica Jurado, Arunpreet Sandhu, and Eric Vignola. With Morada's help, Silicon Valley opened its doors to the students. In addition to meeting leaders across the technology world, they toured Google and Oracle, visited the Intel Museum and the University of California, Santa Cruz. They also met with alumni in marketing, creative design, and non-profit education. And they conducted an impromptu scavenger hunt across Stanford University and participated in a big data game challenge for the Silicon Valley Education Foundation. For the students, it was a transformative experience. "We met individuals at every stage, age, and career path in Silicon Valley thanks to John. Many of the speakers offered to introduce us to people in our fields of interest," says Eric Vignola (BS computer science '17). "We received advice on a range of topics including venture capital, software design, and career networking. All of these skills are invaluable, and knowing people so willing to lend a helping hand in Silicon Valley is a huge benefit to our future success." For Erica Jurado (BS computer science '18), the trip confirmed her decision to pursue a career in technology. "I've lived my entire life on the East Coast, and this was a wonderful opportunity to get a taste of Silicon Valley," she says. "I've always loved tech, but I've only recently decided to pursue a career in this area. Getting this exposure to tech startup culture has helped me better understand what I value and what I want from my career." Arunpreet Sandhu (BS computer science '18) said the tech safari opened his eyes to new possibilities and careers. "Going to Silicon Valley really showed me how revolutionary tech is," he says. "I realized that computer science can be huge. From website building/designing to game development, there is just so much stuff out there, and thanks to this trip I found out I have a lot to learn." Morada was uniquely positioned to get the students access to Silicon Valley thought leaders. As AU's San Francisco chapter president for three years, he built a network of AU alumni. He also reached out to his personal network and worked with Starr and Elizabeth Harless, assistant dean of development for the College, who suggested additional AU alumni who signed up to help. Morada credits his time at AU with building his own networking and people skills, two key things that have served him well in his career and helped him make the jump from programming to business development. "I was not only able to understand technology, but also people and diplomacy," he explains. "Much of that is thanks to American University and being exposed to all its different schools and people and personalities. I learned to listen first and hear my peers and work with them on cooperative projects. I will attribute teamwork to being the key success factor in getting me through my senior year. It's those memories bringing me back to AU every time I get homesick. DC is still where my heart is." Time and time again throughout his career, Morada has looked to his AU network for connections, opportunities, and mentorship. "It shows you the wealth of our alumni network," he says. "If you build strong relationships, they can last you a lifetime."